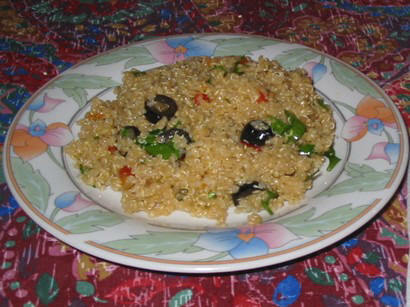 Boil water in a pan, add the quinoa and cook until the seeds are opened. Finely chop the onion and cut the tomato into small cubes. 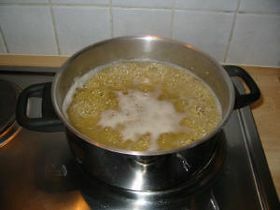 Fry gently the onion in a pan with some oil. 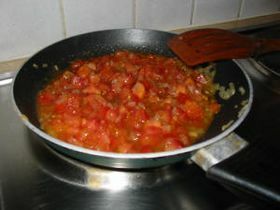 Add the tomato and let it cook for a few minutes while seasoning with salt, pepper and oregano. Cut the olives (without core) in two pieces. 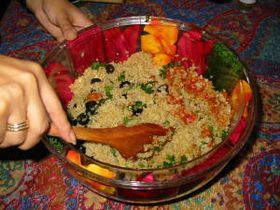 Mix the quinoa and tomato sauce in a salad bowl, add the olives and chopped parsley. 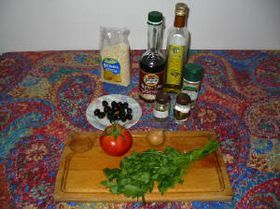 Prepare a vinaigrette (with olive oil and vinegar) and mix well with the salad. Serve cold.